If you've always wanted something built into your car, but have never seen it done before, call Bentley. They can tailor-build your Mulsanne–for a price. Shopping for a 2014 Bentley Mulsanne is like buying tailor-made clothing. If you want it, you can have it. The 2014 Bentley Mulsanne is a rare piece of automotive culture--a flagship for the Bentley brand, an ultra-luxury four-door that brushes aside "premium" brands like BMW and Mercedes-Benz, it's astonishingly expensive and stunningly crafted. The Mulsanne's classic design, immense horsepower, and painstaking attention to detail give it some rational basis for its lofty $325,000 pricetag. With its long profile and what seems to be an even longer wheelbase, the Mulsanne won't be mistaken for this new breed of four-door coupe, but it won't likely be confused with anything else on the road, either, thanks to its upright grille and distinctive Bentley curves. A 6.75-liter twin-turbocharged V-8 engine lies beneath the Mulsanne's expansive hood, and it's rated at 505 horsepower and an extraordinary 752 pound-feet of torque. Power isn't the behind the Mulsanne, though. Instead, it's all about the style, comfort and accommodations. And that story is rich, indeed. One-hundred-seventy hours of hand-crafted construction go into each Mulsanne's interior. That includes a hand-stitched steering wheel, a "waistrail" of wood that encircles the cabin (including one unbroken piece that spans the dashboard), 24 colors of leather upholstery, and pure wool Wilton-weave mats over unique carpeting. The word "sumptuous" doesn't begin to cover it. In early 2012, Bentley unveiled the Mulliner Driving Specification, which adds unique interior elements (like diamond-quilted, perforated leather; knurled controls; and baseball-stitched leather on the gear lever) as well as an additional touch of sporting flair, with two-piece 21-inch alloy wheels, a Sport setting for the Drive Dynamics Control system, and more. For 2014, the Comfort Specification also receives "airline" style headrests, new footrests and cushions. There's also a new iPad "picnic table" and wifi hotspot built into the Entertainment Specification, and the previous window shades can be replaced with actual curtains. All Mulsannes have the option of a sunroof and a two-bottle champagne cooler in between the rear seats, naturally. As you might imagine, nearly anything you could want is available as a (custom, special-order) option on the Mulsanne, not that it isn't nicely equipped in its most basic form. For those with a taste for the unique or extraordinary, however, the sky is the limit. Neither the NHTSA (National Highway Traffic Safety Administration) nor the IIHS (Insurance Insitute for Highway Safety) have crash-tested the $325,000 Mulsanne, but then, with 5,700 pounds of steel, wood, and leather ensconcing you, you're sure to feel safe. Of course the Mulsanne also includes all of the modern safety features like front, side, head, and thorax airbags; traction and stability control; and pyrotechnic, pre-tensioning three-point seat belts. 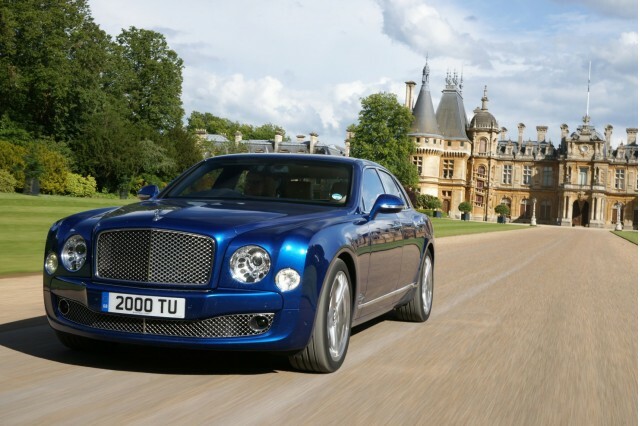 For more on this ultra-luxury sedan, read MotorAuthority's first drive of the Bentley Mulsanne.